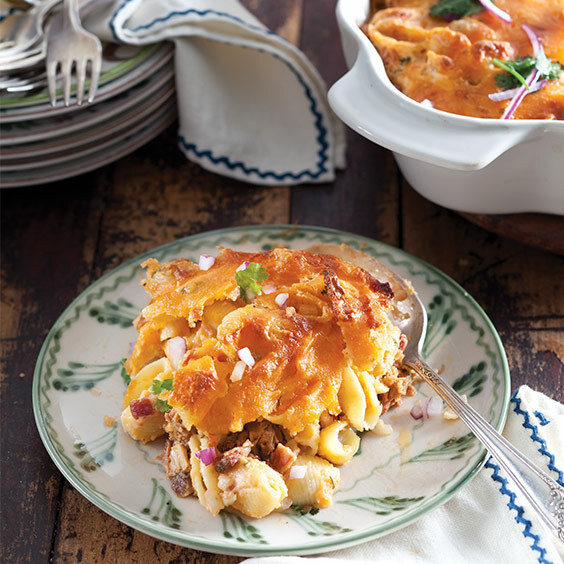 This tasty Barbecue Mac and Cheese is an oh-so-good mixture of pulled pork, barbecue sauce, shredded Cheddar cheese, cream cheese, and chopped bacon. Preheat oven to 375°. Spray a 13x9-inch baking dish with cooking spray. In a medium bowl, stir together pork and barbecue sauce. Spread mixture into prepared pan. In a large saucepan, melt butter over medium heat. Whisk in flour, and cook, whisking constantly, for 2 minutes. Gradually whisk in milk, and cook, whisking frequently, until thickened, about 5 minutes. Whisk in 3 cups Cheddar, cream cheese, salt, chili powder, and paprika until melted and smooth. Stir in pasta, onion, bacon, and cilantro until well combined. Spread pasta mixture on top of pork mixture, and sprinkle with remaining 1 cup Cheddar. Bake until hot and bubbly and top is golden brown, about 20 minutes. Let stand for 5 minutes before serving. Garnish with onion and cilantro, if desired. Kitchen Tip: We recommend a vinegar-based barbecue sauce for this recipe; it helps cut through the richness of the pork and cheese.